Here's something that's intrigued me for quite a few years. Saturn - the second biggest planet in the solar system - has an odd feature and it ain't them purty rings: there's a huuuuuge hexagon-shaped cloud formation, thousands of miles to a side, surrounding its north pole. It's a persistent phenomenon that has mystified astronomers ever since it was first discovered. 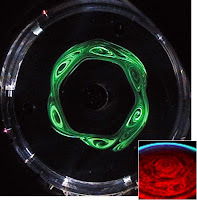 So if you've been baffled about Saturn's mystery hexagon, be bebaffled no further 'cuz Ana Claudia Barbosa Aguiar and Peter Read of the University of Oxford in the United Kingdom have recreated the mechanism in their lab with little more than a bucket of water and some green dye, and set it a'spinning on a variable-speed turntable. And fun was had by all! 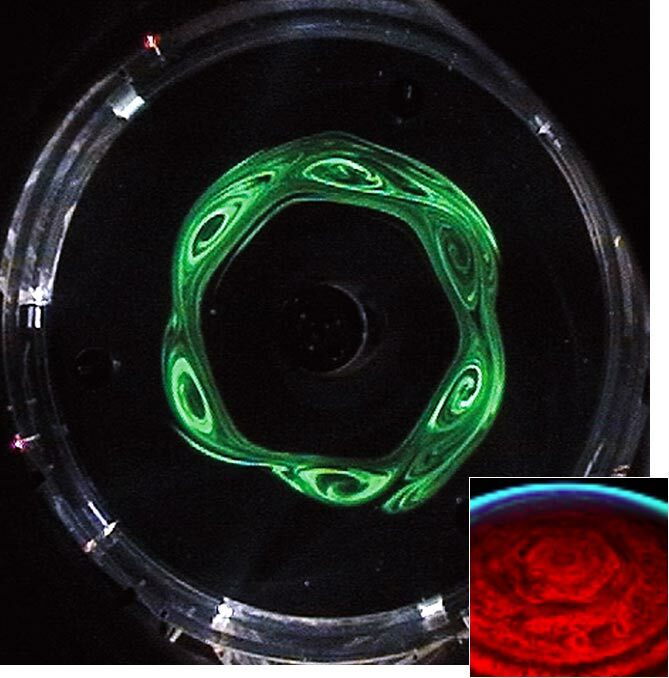 The faster the ring rotated, the less circular the green jet stream became. Small eddies formed along its edges, which slowly became larger and stronger and forced the fluid within the ring into the shape of a polygon. By altering the rate at which the ring spun, the scientists could generate various shapes. "We could create ovals, triangles, squares, almost anything you like," says Read. The bigger the difference in the rotation between the planet and the jet steam—that is the cylinder and the ring—the fewer sides the polygon had, the team reports in this month's issue of Icarus. Barbosa Aguiar and Read suggest that Saturn’s north polar jet stream spins at a rate relative to the rest of the atmosphere that favors a six-sided figure, hence the hexagon.